Drew this on our bathroom wall for our wreath-making party this past weekend. The Mrs. and I have always loved the freedom that chalkboard paint offers. When I was taking years (no exaggeration) to remodel our bathroom in our old house that was old i used to draw on the plaster walls just to keep it entertaining and interesting, knowing one day that we’d paint or paper over them. Of course, if I had spent the time drawing on remodeling, the bathroom might have gotten done a wee bit faster. My friend Rich used to live in a house in W. Conshohocken with a bunch of dudes. Each time they had a party they let everyone draw on their walls with markers and crayons. They’d paint over it before the next party. That house was eventually torn down. When we moved to this house we knew we wanted everyone to draw on our walls. So the Mrs., a master blackboard paint applier, did up our powder room for guests and family alike to scrawl graffiti, draw pictures, and leave messages. 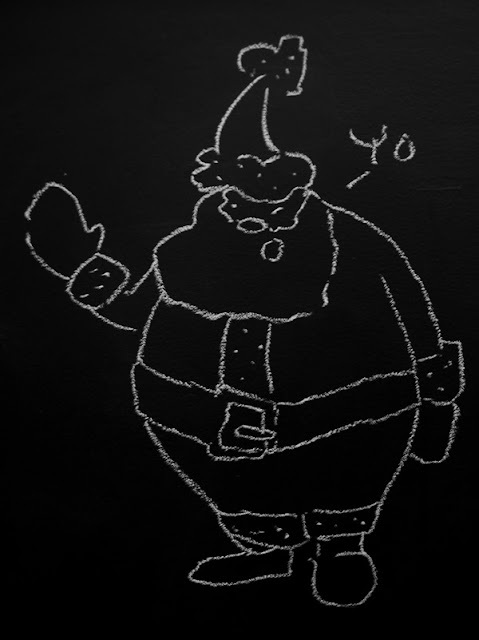 This entry was posted in blackboard, chalk, chalkboard paint, santa. Bookmark the permalink.